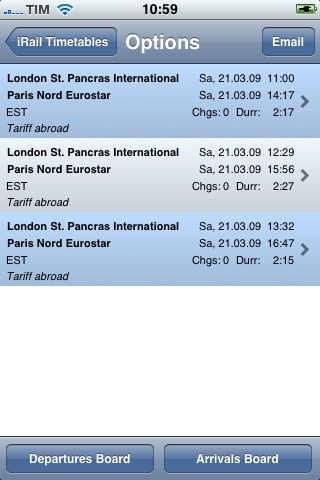 iRail is an iPhone application to view European Railway Timetables. To use iRail enter the point of Departure and Destination into the main screen and click the search button to display a list of routes available after the time and date you select. 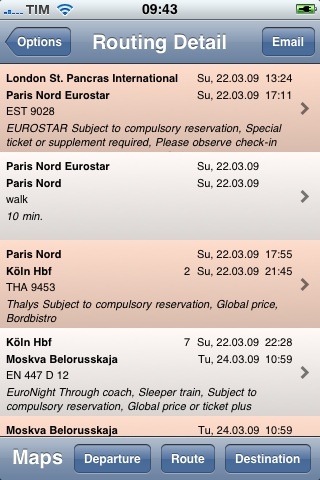 Click on one of the options to view the individual train services and changes which comprise the journey. 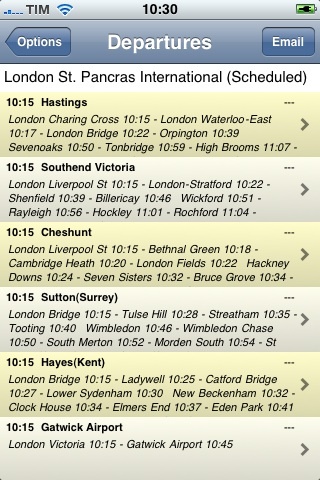 Click on any of the services and the detail screen opens showing all stops on the journey and their times. Maps of the departure and destination stations and their surrounding streets can also be displayed along with a graphic of the route taken and alll information can be emailed at the click of a button. By clicking on the language flag on the "info" screen you can select the language to display train information from English, German, French, Italian, Spanish, Dutch, Danish, Polish and Turkish. A full history of previous stations used is also kept and can be selected from a list, ordered by date or alphabetically. The info screen displays the number of kilo-bytes transferred by the application since it was installed so you can keep an eye on any roaming data charges. 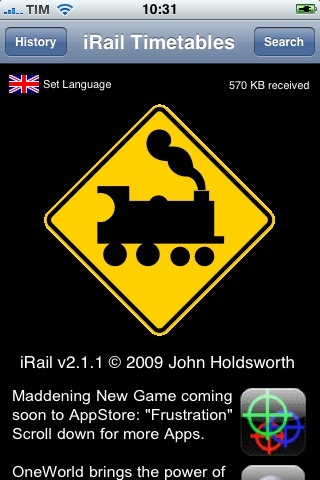 I hope you find iRail useful. If you encounter any problems or have an suggestions drop me a line by clicking here. Update Jan, 2010 A number of you will be having problems with the well intended "In order to protect the datasource..." message not going away after 48 hours. A new update is out which will count down otherwise just delete iRail and re-sync from iTunes and the message goes away. John. This is the main screen of iRail into which you enter the Departure and Destination stations and select the date and time you wish to travel. You can reverse the stations using the arrow icon or open the history. The Options display screen shows the next few departures available to your destination listing the times and changes for the journey. Use the toolbar to view the departures board for the departure station. Tapping on a option opens the Routing Detail screen displaying the individual trains and changes which make up the journey along with any applicable supplements. Station and Route maps are availble. Clicking on any of the train services in the Routing Detail screen opens this detail view showing all stops during the journey. 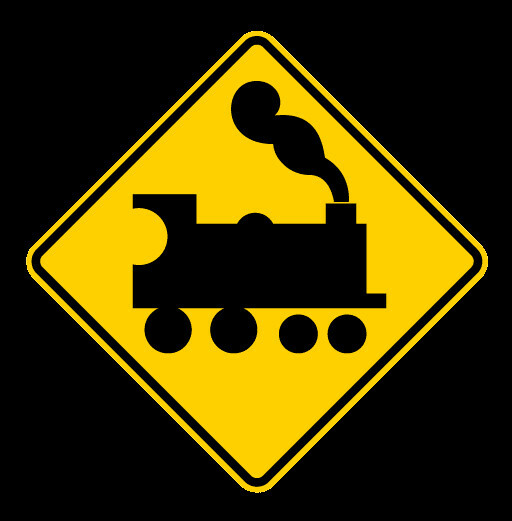 Platform numbers will be shown where available. Click email to send the information. 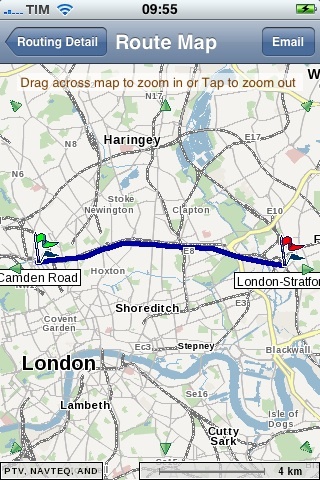 Clicking on one of the legs of your journey in the "All Stops" page will show details for the train service fo that leg. In this case this is for the "Trans Siberian". Click on a station to see connecting services. This is the station history screen which can be sorted by date or name and edited in the usual manner. Departures boards are availble for certain departure stations. This information is not real time however. 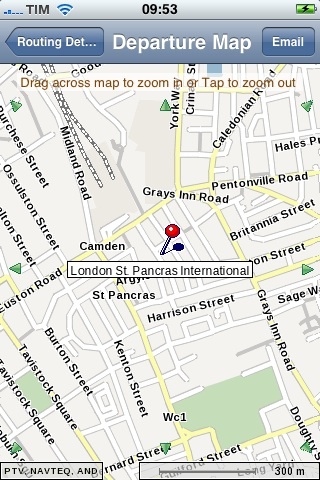 This is an example of the street maps which can be viewed for the Departure and Destination stations. The route of the journey can also be viewed. Drag across the screen to zoom in and Tap to zoom out. On the information screen the total amount of data received is shown along with the language selector.